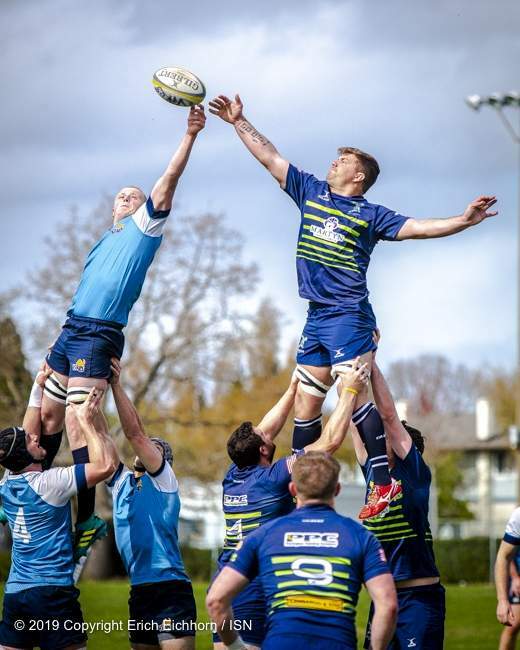 April 6, 2019 Victoria, BC ( ISN ) – In the words of Vikes head coach Doug Tate, “ Any time you score 80 points in a Premier game that’s a lot of points “, that’s exactly what UVic did Saturday afternoon at Wallace Field as they dismantled the visiting 7-8 Seattle Saracens 83-25 to finish the regular season 10-6 in BC Rugby Union’s Premier Division in dominating fashion. The Vikes would score, and score often, doting the ball down thirteen times, eight of them in the second half alone. In a game that would have little impact in the playoff standings, the Vikes, despite sitting some of their veteran players to start the game, would offer little quarter in the victory. “The guys are playing some really good rugby right now. We started off rusty, but we have a very fast team and that is where our strength is right now,” Tate would explain. The Vikes, on a tear of late, have left a trail of lopsided victories lately, amassing a 364 – 80 point differential over the last 5 games. Undefeated in those last five, albeit admittedly against some teams lower in the standings, the sixth place Saracens could have been said to be the litmus test as to what half of the standings ladder UVic belongs to sitting in fifth place going into the day’s match. Despite a problematic first half passing the ball with consistency, the Vikes would prevail on a stronger defence to open a 29-10 lead at halftime. The Vikes would get first half scoring from Logan Martin-Feek, Brennig Prevost, Thomas Heuser and Ollie Nott. Head Coach Doug Tate would recognize his team’s defensive play in recent matches. “ I think we are playing much better defensively than the first half of the season where we struggled a little bit, Tate would comment. “ I think that’s been the big change for us.” Defense has been a strong suit in UVic’s game of late, holding their opponents to an average of sixteen points per game over the last five games. The Vikes, shifting gears in the second half, would out-pace the Saracens exploiting their defense ball possession and with a faster wing lineup that would dominate the pitch the last forty minutes of play. Veteran fifth-year winger Kapi Vataiki would seemingly be UVic’s catalyst to open the flood gates for the Vikes’ 54 point, second half scoring explosion with a pair of back to back corner tries in the fifty-four and fifty-fifth minutes of the game to take the wind out of Seattle. Winger Noah Bain would contribute a pair of trys as well for his Vikes team in the second half, and Jenner Tuefel and Ethan Hager would round out the scoring with single trys in the victory. The win marked the final home game for graduating players Kapi Vataiki, Crosby Stewart, Ollie Nott and Gradyn Bowd. The Vikes will finish in fifth place and will either play the UBCOB Ravens or the Castaway Wanderer’s in a first round playoff away game April 20th. . With a bye weekend on April 13th, Tate’s Vikes will look forward to an opportunity to rest their players in advance of their quarterfinal showdown.